Can You Really Recycle Clothes? On the average, consumers throw away 70 pounds of clothing per household per year. Nearly 13 million tons of clothes are dumped in U.S. landfills annually. Despite the fact that about 4 billion pounds of clothes and textiles are recycled annually, 85% are not recycled, and end up in landfills. Clothing and textiles are 100% recyclable. You may already donate your gently worn clothes to local nonprofits, take them a consignment store for resale, or participate in online garage sales, but some of your items with rips or stains may not be suitable for donation. 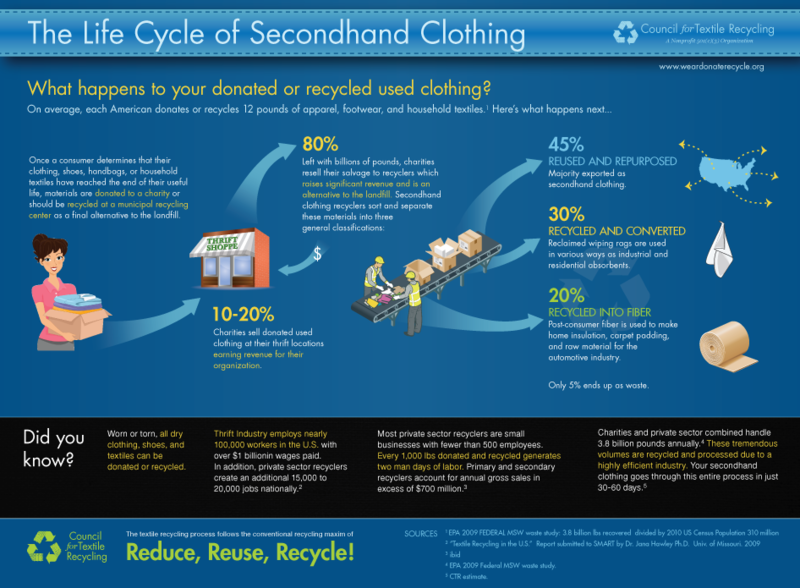 Here’s what happens to used clothing after you donate to a thrift store. What do you do with items that you doubt anyone would want? You know, the jeans with the broken zippers, the belt with no buckle, the dress with the rip down the side? Any clothes, shoes, accessories or household textiles that don’t sell at thrift stores are sold in bulk as salvage to recyclers. And these recyclers sort the used textiles for further distribution and repurposing. All but about 5% of your old clothes can be completely transformed. Clothing can be converted into fiber and used to manufacture all sorts of products, including carpet padding, rubberized playgrounds, and materials for the automotive industry. Organizations like Blue Jeans Go Green even recycle your unwanted blue jeans into housing insulation! Where Do I Bring My Unwanted Clothing and Textiles For Recycling? Use the recycling locator via this link to find out where to bring your unwanted materials. Are There Tax Write Offs When Recycling Clothes? Unfortunately, since you’re donating for scrap, these items don’t carry a value, therefore, you can’t write them off on your tax returns. But if the condition of the items is such that the thrift stores won’t take them, recycling clothes is a great option. How Can We Keep Discarded Clothing and Textiles Out of Landfills? Never throw any clothing or fabric household items in the trash. Donate unwanted clothing to friends, charities, or thrift stores. Never donate wet or moldy items to charities or thrift stores. They will not clean or dry them, and they’ll end up in a landfill. Cotton shirts and socks make great dusting cloths. Use worn bath towels to line a pet kennel, and to dry pets and cars after washing. Repurpose old mattress pads and blankets as bedding in the dog’s kennel or house. Turn jean or pant legs into throw pillows. Cut off legs of jeans, khakis pants, etc. Sew one end closed. Stuff with discarded, clean clothes or fiberfill and sew other end to secure. Cut fabric swatches from your shirts, dresses, sweaters, scarves, etc. to use in craft and sewing projects. Check out these clever ideas from Good Housekeeping! What resourceful or creative ways have you found to recycle clothes and accessories? Tell us in the comments below. Hi Earth911, thanks for the great resource for our readers! Thanks for including our recycling locator! As you mention in the story, there are lots of great things to do with clothing before recycling it, but when it’s truly reached the end of its useful life and can no longer be donated or upcycled, recycling is the best option. Our church ladies use sheets, blankets, pillow cases, and other clothes items,(which they cut apart) for quilting, and making blankets to ship to Lutheran World relief. they then get used in case of floods, tornadoes, hurricanes, and many other places where there is a need for blankets.. I myself have made denim jean quilts for our grandkids to take along to college or keep in the trunk of their cars, as Winter survival kits. since we have harsh Winters in our areas. also use extra fabric for patching of clothes..
Also I find the back of envelopes great for recycling. That grocery store list, to do list, camp stuff list, I also keep a couple next to the phone for those call back numbers. I give my doctor a list of aches and pains on the back of an envelope. Please think about donating towels, comforters,etc to the humane society or pet rescue. I volunteer and can tell you anything soft and cuddly is appreciated by our clients. I always take clothes to a Hospice Store. They sell what they can, send extras to third world countries, etc. I receive a receipt at the end of each fiscal year for a percentage of what they sold for. This I can use on my tax forms as a charitable deduction. Win/ Win.